Let all living things praise Lord! As fall continues to take hold, let us continue to take in and enjoy the waning splashes of color and life on campus. While walking to South Dining, this radiant yellow butterfly was spotted in a purple hydrangea. The brilliant contrast of colors made it stick out like the proverbial sore thumb. 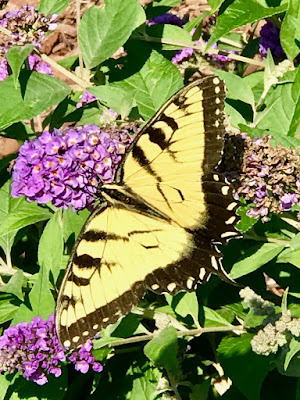 Did the purple contrasting in such a way so as to attract this yellow butterfly ? Whether it did or did not really doesn't matter as the sight is simply stunning and just another reminder of the beauty of God's creation... things both great and small!